Mr. Toni Ikävalko and Mr. Eero Mattila went trolling on a small lake in Southern Häme 11.5.2013. Fishing trip became a real jackpot, as the anglers got two zander weighing amazing 26 kilos together. The bigger giant, 14.095 kg monster, is bigger than any other zander caught before in Finland by using sport fishing tackle. If the record zander is officially accepted as a new Finnish Record, it will beat the present record 13.74 kg zander caught from Lake Vesijärvi in 2009. Ikävalko told that aglers were fighting the fish half an hour before they lifted it onboard. The lucky lure they used was HK-Varma "Kalkkaro" plug 13 cm in blue and pink colours. Also evening´s other catch was really big weighing 12.77 kg. Anglers caught it hour and a half before the record fish. Ikävalko won´t mention the exact name of the lake they were fishing to avoid a probable rush of anglers there. Mattila and Ikävalko have been Finnish record holders also before. Mr. Mattila hold the zander fishing record since 2006. 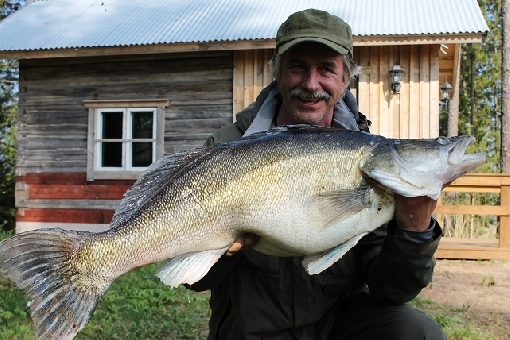 Ikävalko broke his rod fishing record in 2012 with a zander of 11.65 kg.